Do you want to make money just by completing simple tasks from your couch? You can do that with a well-established platform called PrizeRevel. ​In this PrizeRebel review, I am going to walk you through its main features and give you my honest opinion about it. You may also want to check out my top recommended program, which helped me build a lucrative site and reach $1,000 per month from my laptop. No experience required and free to get started. Recommended? For pocket money, yes. Similar alternative: Offernation is also an incredible GPT site if you want more opportunities (You only need to earn $1 to cash out). 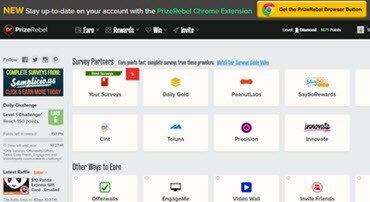 PrizeRebel is a get-paid-to (GPT) platform that allows you to get paid for taking surveys, completing offers and watching videos. It connects you with marketing research companies and advertisers that are willing to pay you for these tasks. You can also take advantage of their referral program and earn commissions for inviting other people. Every time your referrals complete surveys and offers you will get 20% commission, which is awesome. With this strategy, I make $150+ per moth withou actually having to take surveys and accept offers. Click here to discover the step by step program that helped me build this referral money machine! There are lots of surveys available. Get paid via Paypal, gift cards, and Bitcoin. Depending on your profile, it's tough to qualify for surveys. You are still trading time for money. After you create a free account, you are encouraged to answer a simple profile questionnaire. It will ask you about your age, education, profession, income level, among other demographics. It's important to respond these questions to guarantee more surveys that match your profile. 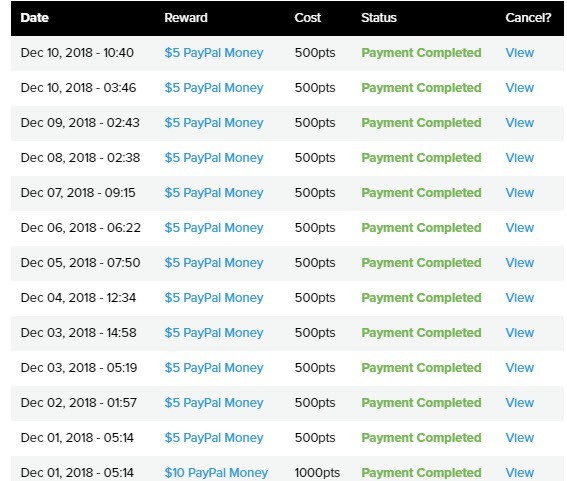 ​Just like Swagbucks, iRazoo, and InstaGC, PrizeRebel rewards you with points that you can exchange for cash via Paypal, Bitcoin or Gift Cards. Many websites don't pay a single penny if you get disqualified. At least PrizeRebel will give you 1 point for each attempt, which is better than nothing. Usually, the longer it takes to complete a survey, the more points you get. But as you can see from the examples above, that's not always the case. ​Earning 200 points or $2 for 10 minutes is the same as $12/hour, which is not that bad. However, $1,62 for 19 minutes is not even $5/hour! That's why you need to calculate your hourly wage and focus on the surveys that pay more for your time. Completing Offers - Be very cautious here! Every type of offer has its annoying disadvantages. Another example is when you sign up for a prize draw. They always ask for your email and phone number to participate and earn a few points. Once you tick the box, you accept receiving marketing calls and SMS for the rest of your life, unless you unsubscribe. With GDPR regulations, europeans have the right to erasure of their personal data. Also, they can participate without granting advertising consent, usually by sending an email to the advertiser. Now, if you live outside Europe, you may not see this option as companies are not bound to GDPR regulations. As you can see, you need to be very organized and read the terms and conditions carefully before completing offers. ​There were no videos available to me in the UK, so I can't give you accurate information. But looking at other GPT sites, I can only assume the payment is very small. ​As for CrowdFlower, this is a crowdsourcing platform where you can perform tasks such as tagging, categorization, product data digitalization and a multitude of other micro jobs. You need to be fast and accurate to get more opportunities and get a better payment according to your badge level. 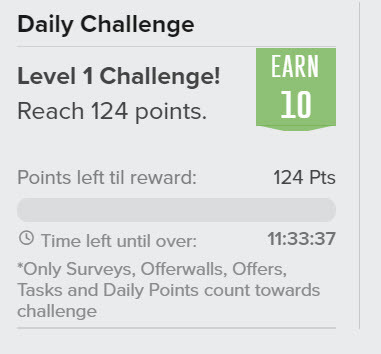 To be honest, I think completing Crowdflower micro tasks is very discouraging! The Daily Challenge are small bonuses that you get when you reach a given number of points in a given amount of time. Someone becomes your referral when they click on your affiliate/referral link and joins the platform. Then, you will get 20% from all their earnings. What's exciting about it is that the more people you invite, the more money you will earn on autopilot. ​If you want to redeem via Amazon Gift Cards, the minimum threshold is only 2 GBP, which is equivalent to 250 points. Now, if you want to cashout via Paypal, you need to reach a minimum of 1000 points, which will give you $10. You can also exchange you points for Bitcoins and for other gift cards. ​PrizeRebel is a legitimate GPT platform where you make money for simple tasks. To be honest, this is one of the best I came across so far, although it's not as popular as Cashcrate or Swagbucks. If you want to earn a few extra bucks completing surveys and offers, this one should work well for you. However, that's not how I prefer to make money online because it's very inefficient. So, if you are serious about making money online, stick with me until the very end. Click Here and Get Your Free Account! It's possible to earn a living online and achieve the freedom of working whenever and wherever you want. That requires commitment, but I can tell you it's worth every drop of sweat. One of the best strategies is to build a website and promote other people's products as an affiliate marketer. By writing valuable content on your website, you can promote products that you believe in and earn generous commissions. Some companies like Amazon pay 6%, while other pay 50% and even 75%! 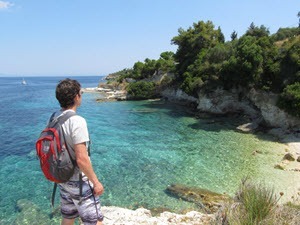 By the way, that's what I am doing to earn over $1,000/month in passive income. As my website grows, so does my income. You may think this is not for you, but I have seen people from all walks of life succeed at this and transfor their lives! I was exactly in your shoes back in 2015, and I want to show you the right steps, so you don't fall for misleading claims out there. The first thing you need is knowledge! Without knowledge, you will keep stuck working for pennies for marketing research companies. You also need timely support from people who walked the way. I highly recommend you get step by step training and support with Wealthy Affiliate, which is the same platform I use. They will help you set up the foundation of your online business through the first 10 FREE video lessons. Many successful people took this course and now they reap the rewards by working independently from home or anywhere they want! How the power of firing your boss could change your life, my friend? I would agree with you that you won’t make a full time income out of GPT, but if you just want to supplement your income with a little extra cash, then this is okay. Even then it’s not without it’s hassles as you try to get accepted for surveys because you have to go through pre-qualification questions which I think is ridiculous. As you have found, it’s a better strategy to do affiliate marketing with WA, where you build your own website, promote products of other companies and earn commissions. You will be much more successful with this than any GPT programs or for that matter any MLM schemes. Hi Adrian, it’s ok to supplement one’s income, I agree much.Affiliate marketing is way more lucrative. But people lack the knowledge and patience to commit themselves for at least one year. It’s not common to work without gratification, but in affiliate marketing, you have to work for many months without a single penny only to attract an audience.Once they have an audience and start making money, though, the sky is the limit. I highly recommend Wealthy Affiliate’s step by step training for those interested in building their business from scratch. 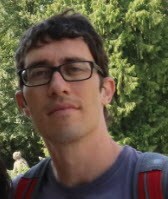 Stefan, thanks for the great reviews on PrizeRebel and other ways to make some extra money. I often wondered if these were worth it; I guess if you have extra time (and determination) you can earn some income, although not enough to live on. And, also thanks for the heads up on Wealth Affiliate. I just joined and couldn’t agree with you more! I joined WA recently and totally agree agree with your review as to the benefits of membership, I am still at that learning curve, but as you say everything I need is within the WA community. I have looked at your site and think that it is very well laid out, very easy to navigate and easy on the eyes. I will take away some ideas from your site to use on my own. I like your honest reviews as I have seen so many scam reviews online that are nothing more than a come on to join some scheme or other, over the years I have been the victim of cons I am ashamed to say, but at last I have found within WA a genuine community so willing to help. The minimum payout is $5 and you can withdraw as soon as you reach the minimum threshold. I withdraw 2 or 3 times a week and they never missed any payment. Hello Friend, I am from south america, I would like to earn a few dollars a week, but in order to get access to the Surveys I need to have a Residential IP from USA, Can You tell me How I can a get an Ip from USA that doesn’t change over time like with cheaps Vpn programs??? thank you. Sorry Daniel, I really don’t know. I thought Prizerebel worked in South Africa. You can also try Panel Station and Toluna. Hi Stefan, I was reading your honest review of a done for you free website and just kept reading & followed your link to this site;however, after reading these comments you might have already caught it but if not the gentleman above Daniel said he was from South America and you’re comment to him was you thought Prizerebel worked in South Africa not South America where he stated he lived. Anyway it’s 3:10 AM and I was scrolling and just happened to catch that and thought I’d bring it to your attention. Hi Julian, yes, that was a mistake, thanks for pointing out. The surveys and offers you will get depend on your country. I think using a VPN won’t work because they may have the technology to detect. Sorry to say that I could not follow the WA lessons and could not get any benefits after two years.I had to quit. I lost my time in reading the advice of others. About 20/50 daily. Every time I was asked to upgrade. There is nothing to get for free. Kyle and Carson could not help me were I was stucked. You GET 10 FREE WEBSITE, BUT i HAD TO PAY EVERY MONTH TO maintain them. Every year I had to pay £394 or something around that to get benefits which I was not able to get. And I was not able to get a DIME. If kyle and Carson were devoted to follow my weakness they could find out where I am getting difficulty and would be able to help me. How all the people at WA are successful whereas me alone could not cope, paying big sum every year. WEALTHY AFFILIATE is not FREE. We have to pay, pay and pay to make Kyle and Carson millionaires.WA is not FREE. Sorry to hear you haven’t achieved the results you expected with Wealthy Affiliate. Not everyone reaches positive results as creating a profitable site depend on many factors. That doesn’t mean the training is bad and doesn’t work. On the contrary. If you search the internet you will see many successful websites that attract visitors from Google and generate revenue using the same WA’s strategy. WA has a starter membership where members can watch the first 10 lessons for free. Those 10 lessons are not enough to learn all you need to know to start making money. The starter membership is mainly an entry point so that people understand the business model and what is expected from you as an affiliate marketer. The benefits are many such as 24/7 support, hosting, weekly webinars and lots of training on search engine optimization, social media marketing, email marketing, and so much more. It’s not as cheap as buying just a domain name with another hosting provider, but one can’t deny the amount of value offered through hundreds of hours of training and the helpful community. The fact you haven’t achieved the results you were after doesn’t detract the merit of WA in helping lots of members who did achieve great results. I can speak for myself as I learned a lot from WA and benefited incredibly from its program. Every week I see success stories, valuable advice from successful members and the whole experience helps me grow my business and discover new opportunities. I also see many people who leave without making any profits, that’s true. However, if they followed the lessons seriously, they know how the business works, and they can use the knowledge to keep growing their business or start another one outside WA. When you leave WA, your business can grow outside of it if you transfer your site to another hosting provider. You can also start another site and take advantage of the knowledge you got from WA.